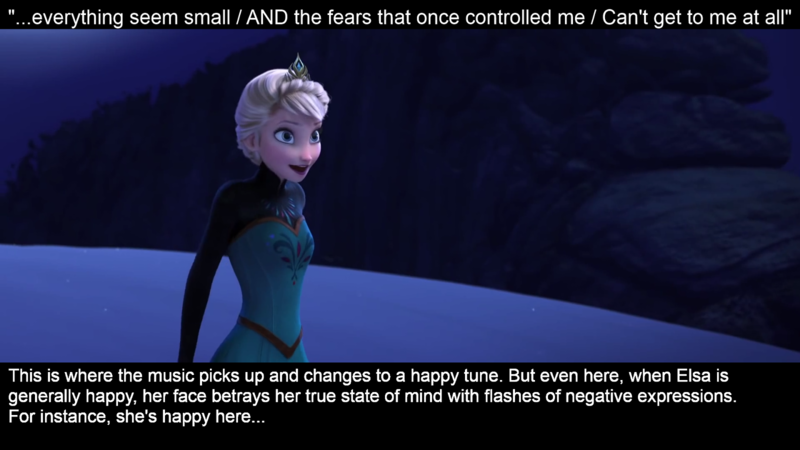 NaClhv: Elsa's facial expressions during "Let It Go", in Disney's "Frozen"
My obsession with "Frozen" and "Let It Go" continues. 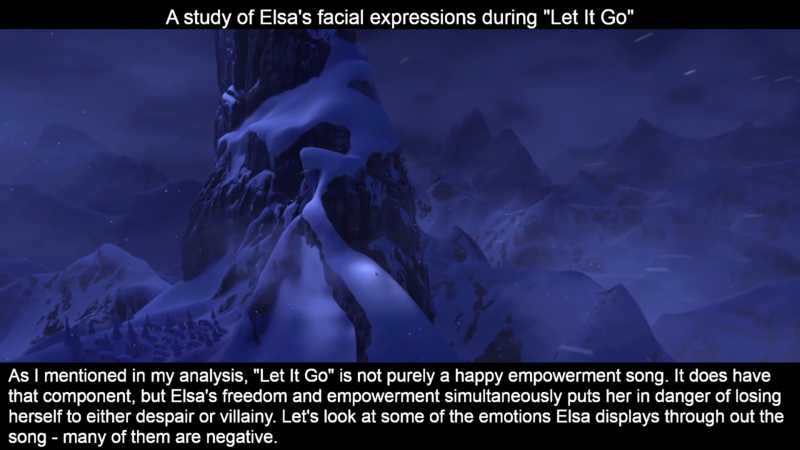 Elsa has fascinating facial expressions during "Let It Go", and this post will explore the meaning of those expressions. Some of her expressions are difficult to catch because they're complicated and they change so quickly, but I believe I have a good, insightful collection of her expressions below. I hope you see many things that you didn't notice before. 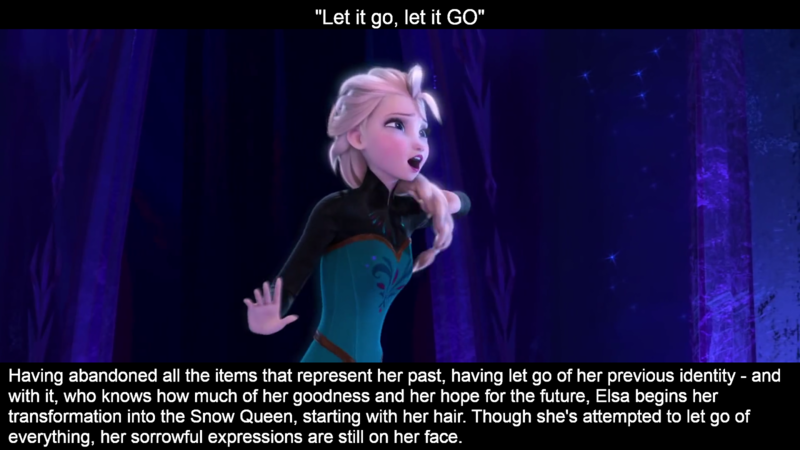 After writing my analysis on the meaning of "Let It Go", I'd long wanted to supplement it with this post. But this blog is supposed to be about theology, philosophy, science, and math, so I've limited myself to one "off-topic" post per month. It's now been a month and I can't hold it back anymore. 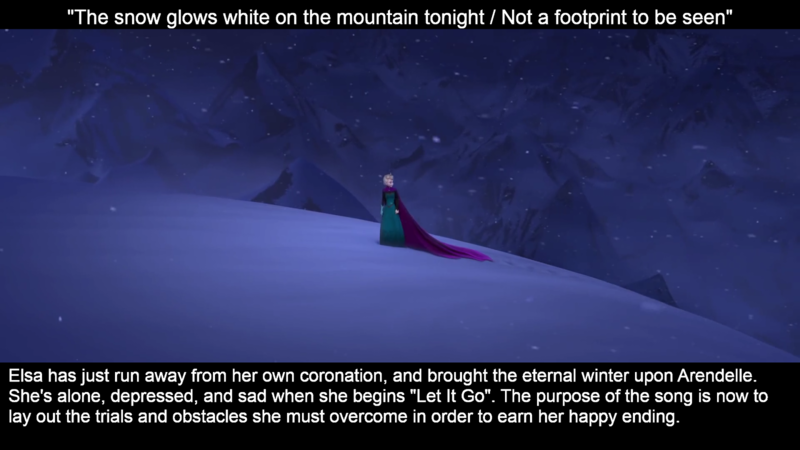 What impresses me most here isn't just the complexity this shows Elsa to have, but the amazing work the animators have done to give such a powerful sequence such brilliant subtlety and nuance. Thank you! 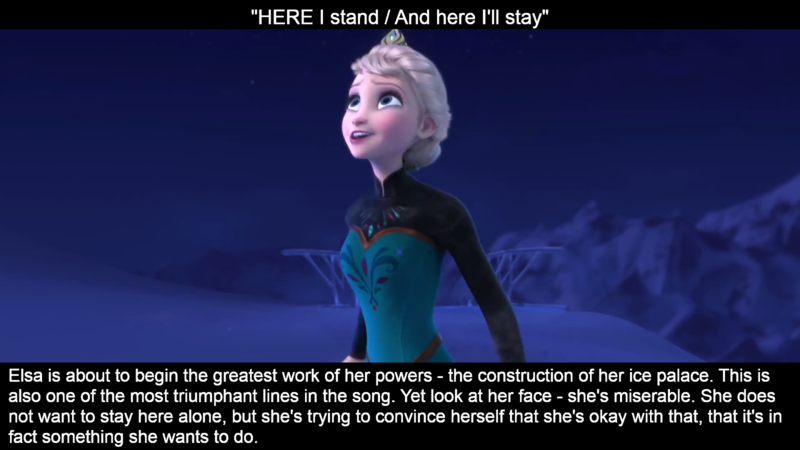 I'm also still amazed at the level of detail and meaning the animators have put into this movie, and this song in particular. Similarly to your first post on this subject, I have to disagree on the way you approached your analysis. 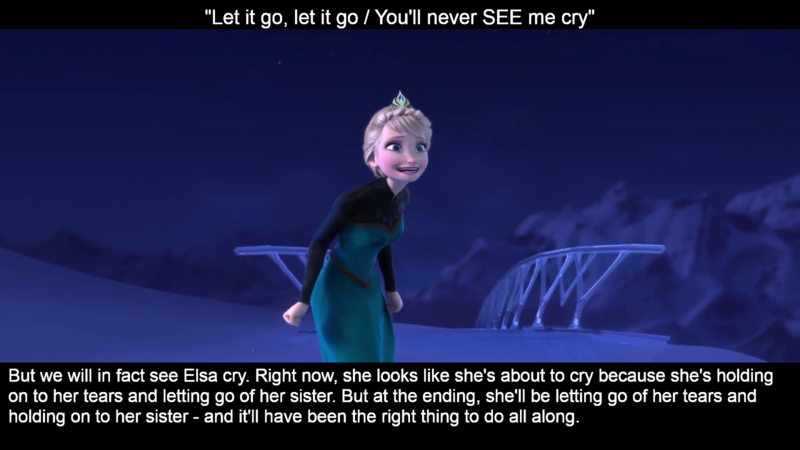 I don't feel that Elsa feeling emotions other than complete elation means that she's lying to herself. Who hasn't had moments in their lives, or words associated with those words that don't bring about micro-expressions of pain and loss? If you've lived with fear all your life, of course the word will cause you pain. 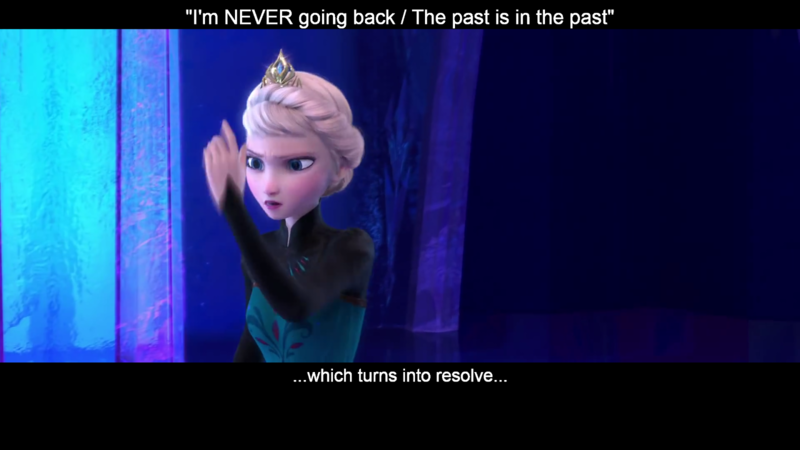 If your past is filled primarily with regret and suppression of your true self, then I see no reason why thinking of setting it aside might not invoke a bit of melancholy for those few, precious _good_ memories and moments which must regretfully be put aside if you're truly to make a new start. 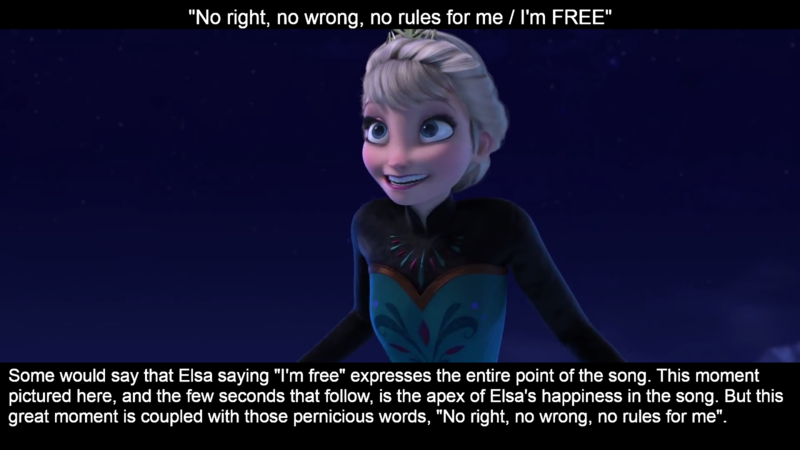 And, once again, I point out that Elsa is rejecting the "act like everyone else" version of "good" and not the moral one. 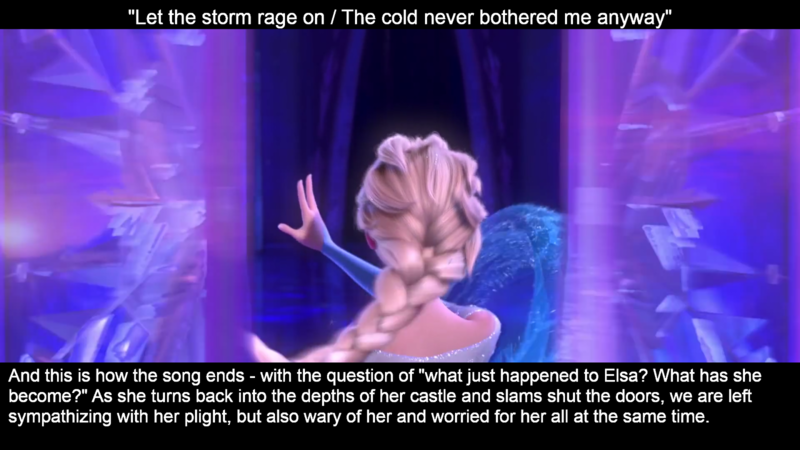 She doesn't know at this point that she's done more than frozen a fountain and caused fear in her subjects (which is what she's told will be the end of her according to the Troll's words when she's just a girl). 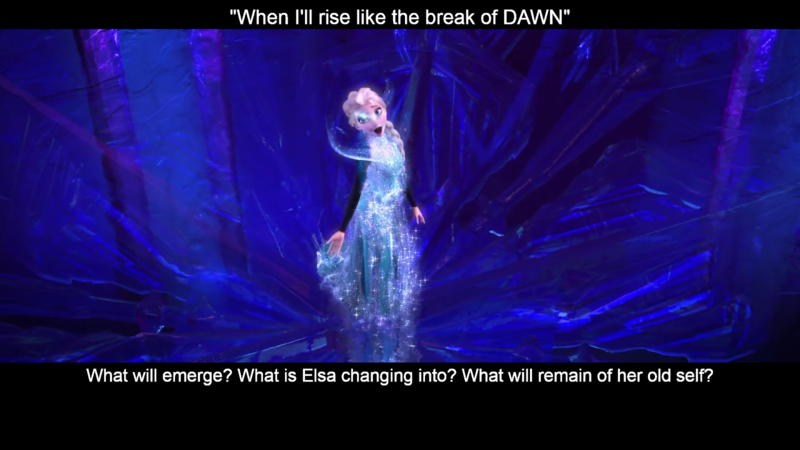 If Elsa had known about the "eternal winter" (the one day eternal winter...), her song would have contained the same regret, but I suspect it wouldn't be about letting go, but rather about finding new ways to suppress who she is. A desperate attempt to be the "good girl" even at the cost of who she truly is. I'm still somewhat amazed how big of a hit it is myself, and how many people are hooked on it! Disney has something unique on its hands here, and I'm very curious about what they'll do with it. 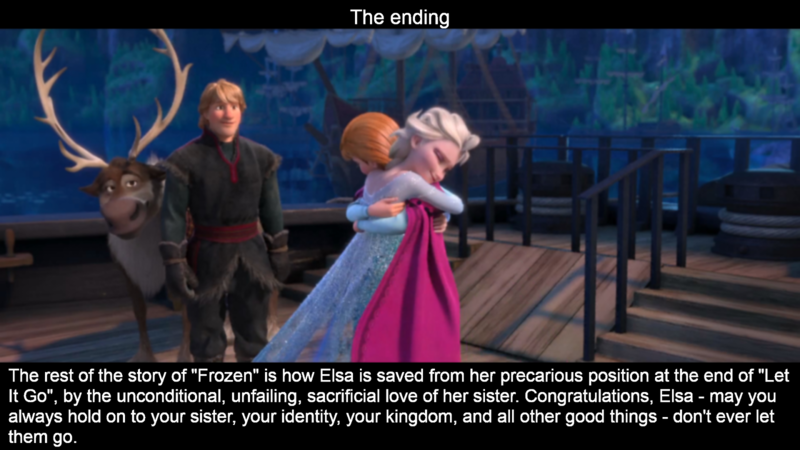 Beautiful analysis of a beautiful movie. Thanks for taking the time to share this. Thank you! I'm always pleasantly surprised when other people also share my obsessions. I love how detailed this is. 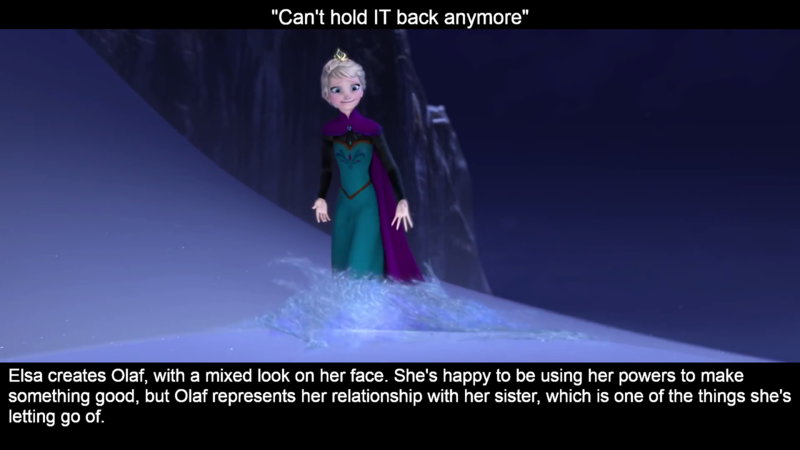 However, I'm actually a little surprised you didn't put the very last expression you see on Elsa's face. Just as she slams the door, she's almost smirking. Oh, there's lots of things that I didn't catch or didn't put in. The filmmakers put in a ton of details and I've only talked about what I noticed and what personally struck me as being significant. But there's certainly more to find for other fans. GREAT analysis. 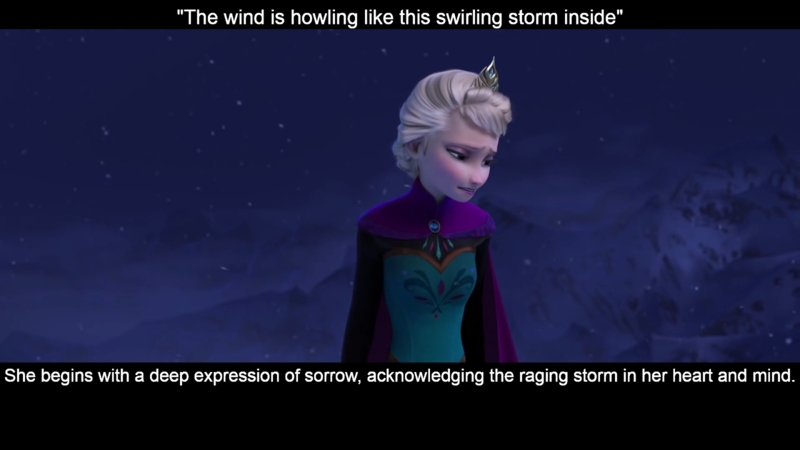 The animators certainly did an extraordinary job. I enjoyed reading how much you could draw from the film and find it fascinating. Thank you for taking the time to share it. I was very pleased to appreciate how they emphasized the fundamental importance of unconditional, sacrificial and unfailing love. 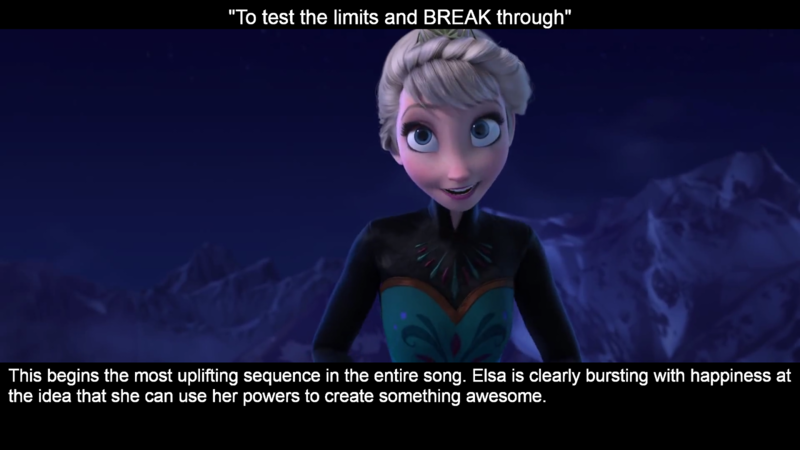 It gives opening to an emotional breakthrough in an individual, in this case Elsa. 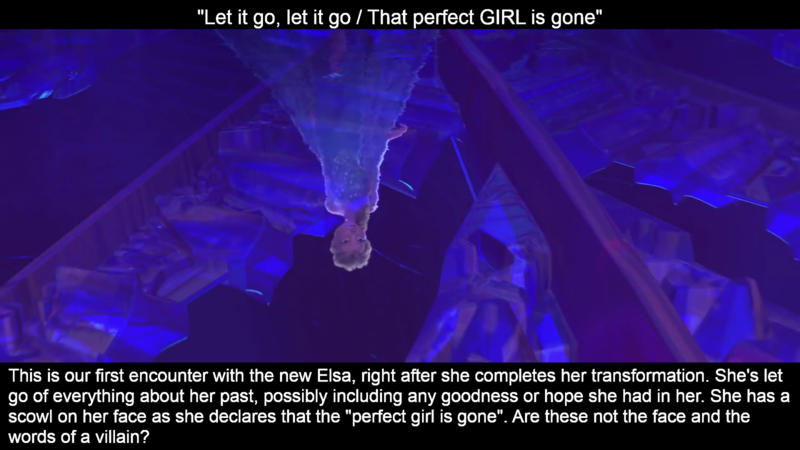 I was pleased to watch how it wasn't the usual happy ever lasting love of the princess when she finally meets the perfect prince but rather a platform to illustrate fundamental issues within ourselves and our society that may need to be acknowledged in order to promote building ourselves instead of finding ourselves. You mentioned: "Is this a good sign -that she's not a completely different person, that she still wants love and her sister and the good of her kingdom? 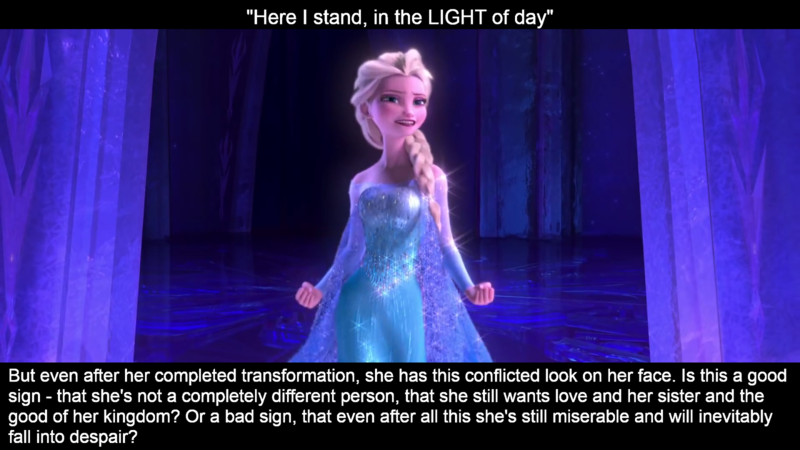 Or a bad sign, that even after all this she's still miserable and will inevitably fall into despair?". The answer could be, both. Is this a contradiction? Maybe not so. It could be implied that it is not necessary to slam shut the doors but to open them to love, openness and forgiveness towards self and others; UNIFY the view of oneself as the same person in the past, present and future understanding changes that need to be made and the need to love and feel loved as well as the feeling of identity in every single individual. Seeking an ongoing and comprehensive personal enhancement. 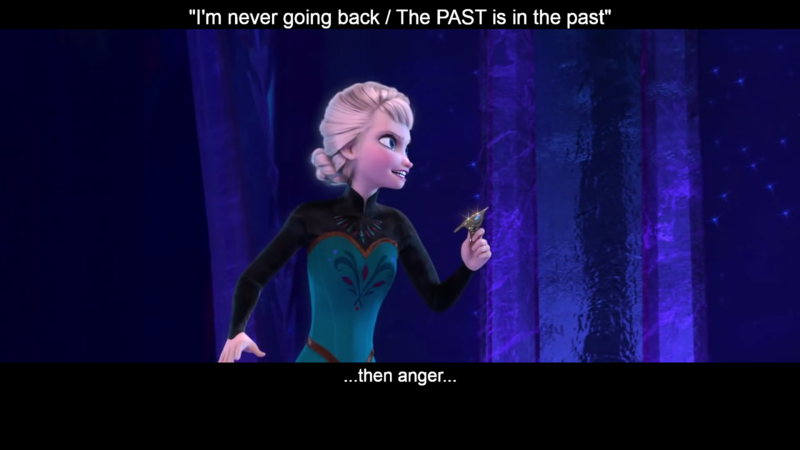 Only then the past and struggle will become, as happened with Elsa, a platform towards an amazing breakthrough bringing growth, openness, learning, joy, love and forgiveness. 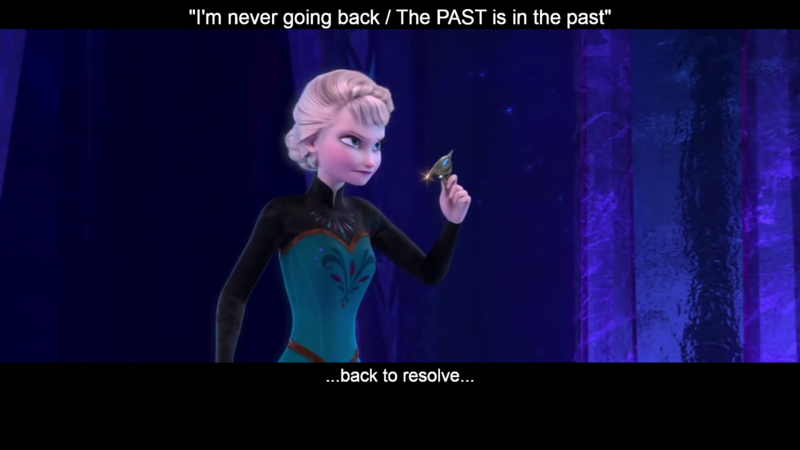 Yes, I think that one of the reasons that "Frozen" has struck such a chord with the audience is that as you said, it's not just a rehash of the old formulas. 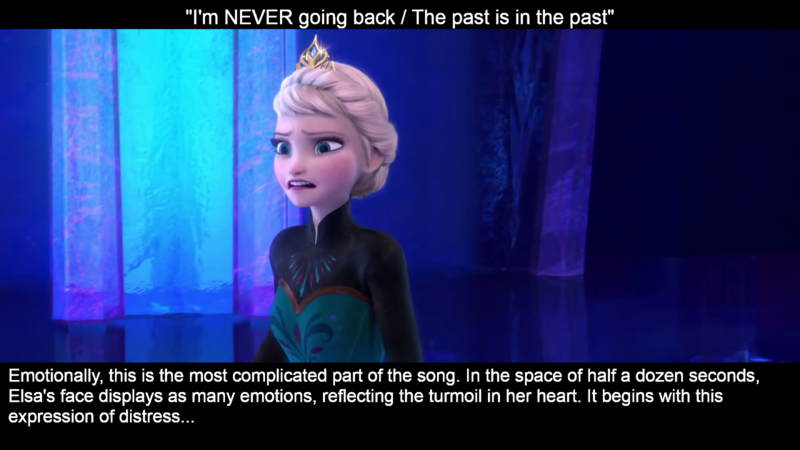 It breaks many of these formulas in half, while telling a timeless story of love in a way that many viewers can personally identify with. 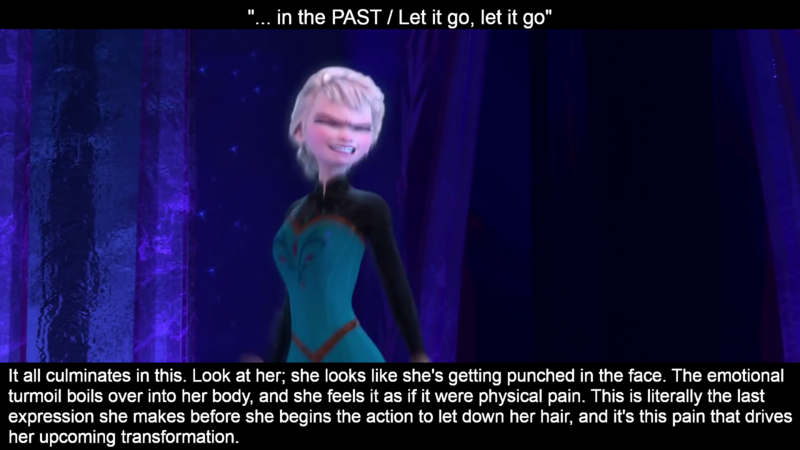 Elsa is an amazing character - probably my favorite one in all of Disney - and a large part of that is the personal transformations she undergoes as in your description. I watched it expecting it to be a *bit* different. However it went and pretty much blew every cliche out of the water. Ella especiall has become a rolemodel/person to identify with for many "outcasts" "others" and "away-from-norm" groups. I kinda felt that Ella did have not enough coverage. 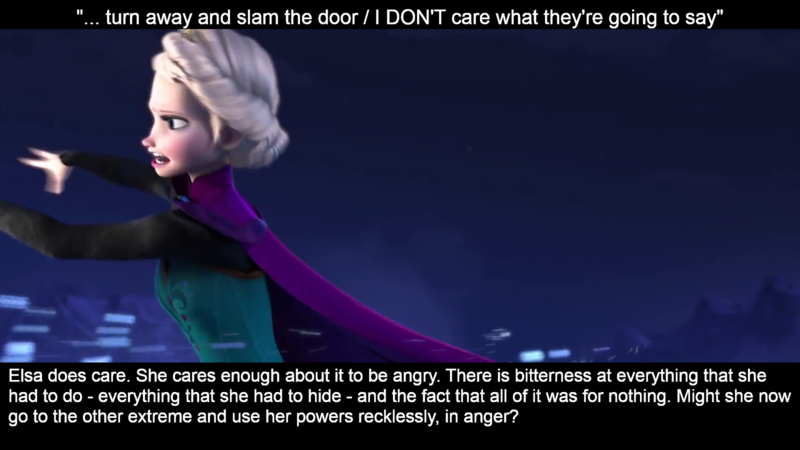 It seems they didn't want to go that far, because the audience wouldn't want to be "bothered" with a troubled character. Thats the only flaw I could find. 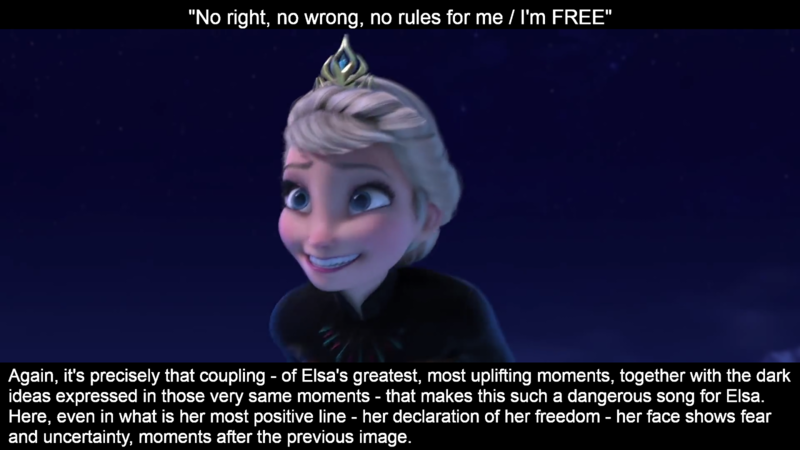 Agreed about Frozen breaking lots of Cliches. 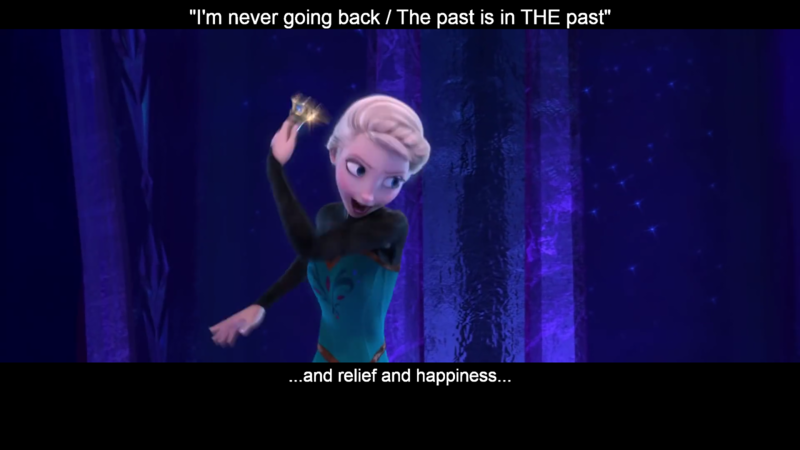 I know that there are a lot of people who wanted Elsa to be the main character - I'm sort of undecided on that - but we can always hope for a sequel! Thank you! You bring up some perspectives that I had not heard anywhere else before! 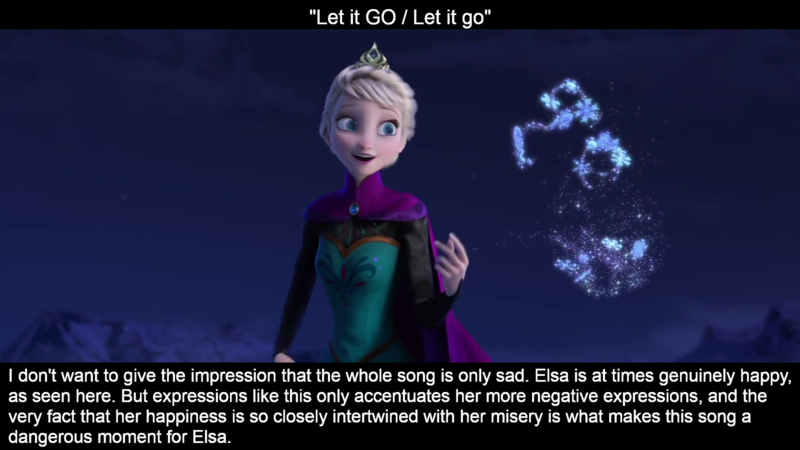 There's certainly more in "Frozen" and "Let It Go" that I haven't perceived yet! Thanks! I hope you look at some of my other posts on this blog. 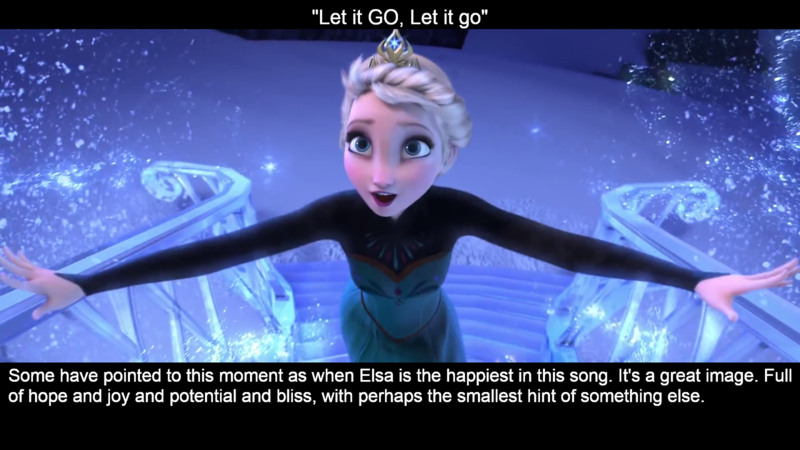 There's a few more related to "Frozen"! Really love this song! 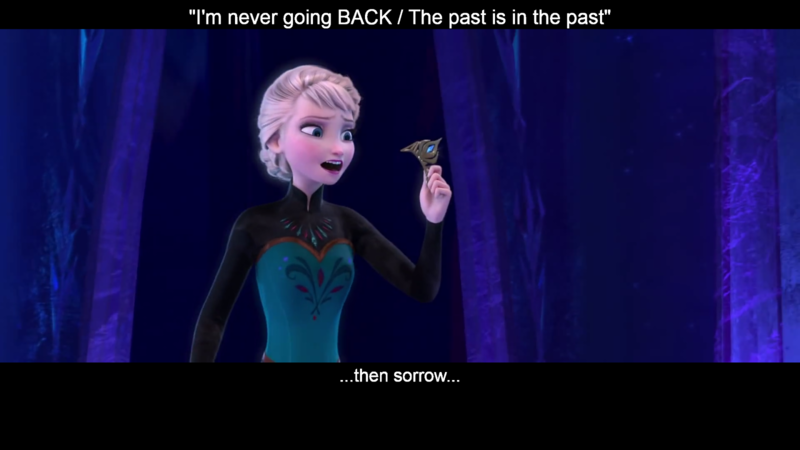 and it was only last tuesday i watched the movie for the first time! i see u mentioned in the beginning concerning the items she discarded. 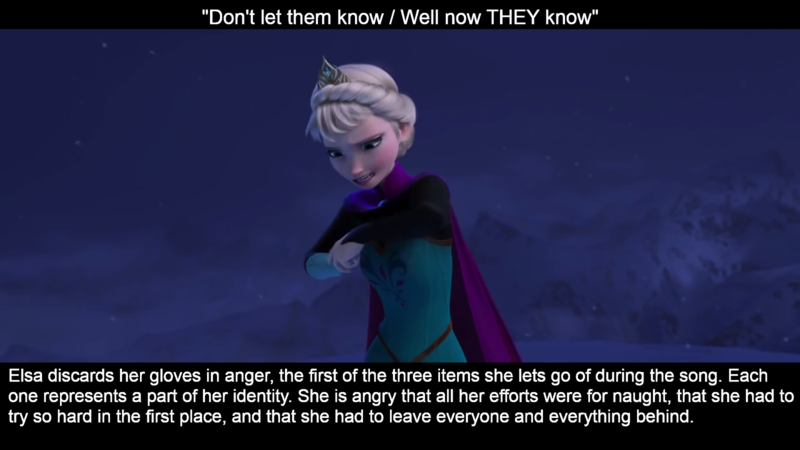 i think discarded gloves maybe referring that she's gonna let go the item that bind her from using her power, while the crown as mentioned above has to do with giving up her royal position and relationship, but what about the robe? 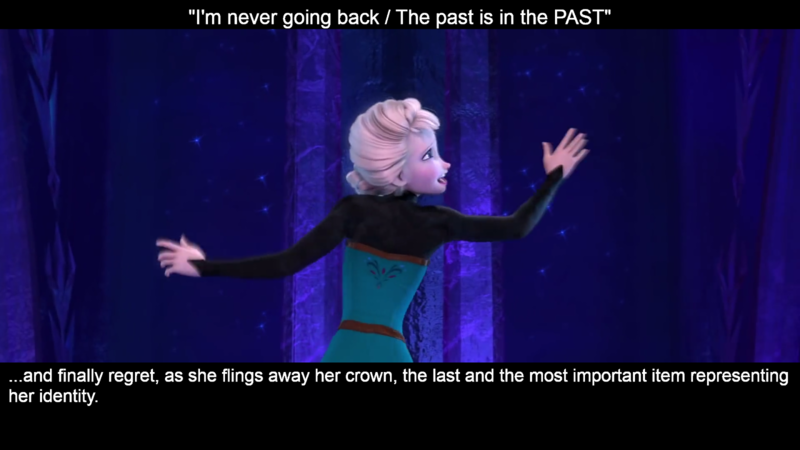 btw it's probably because elsa and i shared a similar personality and i m actually going thru something similar to what has happened to her: giving up something one cherishes most, jus doing so because of afraid of hurting it, so the only choice was to, Let it Go! thank you so much for sharing this!